Lemon Tart - Saving the world from bad baking. 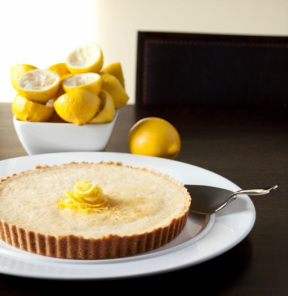 Sugarplum Bakery's Lemon Tart is a thin and delicate tart that will leave you with a taste for more. It's crispy sweet base complements the baked lemony filling beautifully and it is a light temptation you won't be able to resist, having a second piece. Sugarplum Bakery's Lemon Tart is made with the juice of freshly squeezed lemons, not juice concentrate.